"Our theater world is so much better with this book in it, and even better with Cary and Jay at the helm." 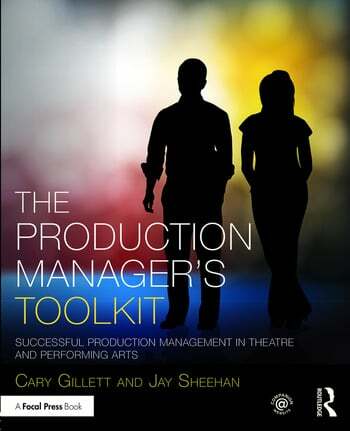 The Production Manager’s Toolkit is a comprehensive introduction to a career in theatrical and special event production for new and aspiring professionals, given by expert voices in the field. The book discusses management techniques, communication skills, and relationship building tactics to create effective and successful production managers. With a focus on management theory, advice from top production managers provide insights into budgeting, scheduling, meetings, hiring, maintaining safety, and more. Through interviews and case studies, the history and techniques of production management are explored throughout a variety of entertainment venues: theatre, dance, opera, and special events. The book includes references, tools, templates, and checklists; and a companion website contains downloadable paperwork and links to other useful resources such as unions, venues, and vendors. Cary Gillett has worked as a production manager and stage manager in the Washington DC area for almost two decades. She teaches production management and stage management at the University of Maryland, College Park, and serves as the production manager for UMD’s School of Theatre, Dance and Performance Studies. In addition, she has worked as a production manager for the Round House Theatre, the Potomac Theatre Project and the Helen Hayes Awards, celebrating theatre in the Washington DC area. She is married to director and educator Bill Gillett, and together they manage their biggest production, Mary Louise. Jay Sheehan oversees the production management and stage management areas for the School of Theatre, Television and Film at San Diego State University. Jay created and leads the Certificate in Entertainment Management Program for the school. As the faculty production manager, Jay oversees all aspects of production for the eight-show main stage and student production season. When he isn’t teaching, Jay also serves as the Logistics Coordinator for the Presidents campus wide Arts Alive SDSU initiative, promoting the visual and performing arts on campus. Jay is also an Equity stage manager, and spent his early career at the Old Globe Theatre. Jay’s other jaunts around San Diego have found him as the Director of Production and Operations for the San Diego Symphony and Director of Operations for House of Blues, overseeing the 20,000 seat Coors Amphitheatre in Chula Vista. Jay is also owner of Cue One Productions, and is a freelance special event manager who produces non-profit charity & concert events in and around the United States.